In this week’s installment of “Ask the Experts,” we went to our cold water guides with the question of specifically targeting the largest fish in the system. Here’s what they had to say about targeting the biggest brown trout, brook trout and steelhead in a given watershed. Timing is everything when pursuing quality trout. In particular, I have found brown trout to be extremely independent and aggressive when they grow to large proportions. Known to hunt larger prey, I believe they rely on the cover of darkness to ambush their next meal. Dark water deliveries is one of the best ways to not only encounter large browns, but there is also a good chance their predatory instinct to attack is triggered. There are three ways to select dark water. First is at night, as the water temperatures began to cool from the warm late summer and early fall days. The last hour of light or first two hours of nightfall will ensure the prime conditions. Searching with large top water meals or lightweight subsurface streamers can produce well. If you are not familiar with the river, presenting higher in the water column can also prevent snags when you search with your fly. Second is weather. In the summer months, when large storms move in producing dark skies, I believe that large predatory browns are fooled into thinking nightfall is near and time to hunt. This is one of my favorite times to swing nymphs or streamers for the ultimate tug! Last, but not least, is dirty water. In the spring, as flows increase, large trout are supplied food that is swept off the banks or ripped from the bottom like worms and scuds. Big browns can then move out of tight quarters or pockets and consume large quantities of non-escaping meals. During this time the edge of the river will clear first and offer the trout a chance at slower currents while they feed. Big brown trout are big for a reason. They have earned their way to the top of the food chain in their river. They have avoided predators such as birds, other fish, and anglers. It’s no wonder they are instinctively more wary. This is why it is important to be dialed in, have the right gear, and it doesn’t hurt to double check your knots. On the rivers we fish here in Michigan, we are blessed with incredible mayfly hatches. Many of these hatches occur after dark which can also be a blessing as bigger trout seem to let down their guard and come out to feed in the dark. Don’t be in a hurry to cast to the first fish you see rise. Let them get into a rhythm and pay attention to the entire run. The bigger fish sometimes make the least amount of noise. Try to make each cast count as if it were your last. As everyone knows, when fishing dries, getting a drag-free drift is crucial. What I don’t like to do is mend on the water if I don’t have to. Bigger fish can sometimes detect this and be put down. Instead use a reach cast and let the fly drift. When fishing at night, don’t be afraid to be the last one out there. Bigger trout will often wait until things calm down on the river. Look behind logs and in back eddies where bugs collect, as sometimes the biggest fish in the river come out to dine in these areas. Streamers and mousing are another way to go after that trophy brown trout. One huge difference between streamers and dry flies is that with dry flies we are searching for fish at are already feeding. With streamers, we are trying to make them to eat. We want to fish flies that entice and create a strike instinct. There are many types of streamers available, from articulated tied with buck tail, to wool heads with dumbbell eyes. Each fly should be fished differently. While big fish do eat small flies, I typically like to use larger flies when searching for that trophy brown. You may not bring out some of those mid-teens fish, but hey, we are looking for that giant brown right? Another thing I like to do is incorporate a little flash into my flies. UV polar chenille seems to have a quality about it that triggers strikes. When choosing a streamer line, don’t limit yourself to just one. There are many different types and sink rates out there. Full-sink lines with intermediate running lines get your fly down deep and seem to work great on wider rivers. Sinking lines with floating heads are great for getting a mend in your line and swimming your fly downstream along logs. Let the river conditions and fly dictate which line to use. When fishing out of the boat I typically carry 2 or 3 different setups loaded up with different lines and flies. Mousing at night is another technique that is often a key to getting that giant trout. While most associate mousing with waking flies on the surface, don’t be afraid to try a subsurface fly. It may not be as exciting as a topwater hit at night, but fishing subsurface seems to also bring out some of the bigger trout. When searching for that brown of a lifetime, nothing increases your chances more than time spent on water. You become more dialed in and in touch. If you do happen to get that trophy, make sure you take time to revive and properly release it. Who knows, maybe you’ll come back again and catch it when its even bigger. After all, you will have its address. It’s certainly difficult to systematically target the biggest fish in a system when you’re talking about a migratory fish like steelhead. That said, there are a few things that can slightly improve your chances. First, time your run right. The rivers I guide seem to have a couple specific times in which the largest native fish of the year will push through. Knowing when this happens on your specific watershed will greatly improve your odds of finding a bigger-than-average fish. Next, edit your water. If you are really serious about just catching the biggest steelhead, look for big fish water. 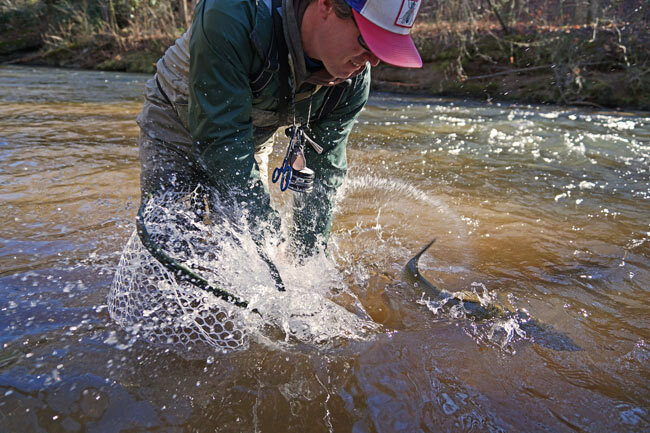 Just like other species, the biggest steelhead take the prime lies. The half dozen or so biggest steelhead I have caught have all been in deep, boulder filled water with a choppy surface, where a big fish can hide and feel secure. If it is an awful wade and hard to cast to, then you are probably in the right stuff. Third, pick your fly. Fly specifics probably matter very little but from what I have seen, larger flashy flies in dark colors like black and blue (or also red) seem to take a higher percentage of male fish (the biggest fish in a given system are going to be male). Many gear anglers are aware that large, flashy spoons will aggravate the biggest male fish; try thinking similarly when you select your fly selection. Other than that, just keep your fly in the water and make sure your tackle is up to the job. A stout rod, heavy tippet, and strong hooks are all very important. Most big fish I see hooked by clients are actually lost because they baby the fish for too long, until the hook pulls out. Put the screws to them early and never give them a chance to rest. You have a better chance that way, and remember: it is your responsibility to make sure they have enough strength left to continue their journey and spawn. As a full-time steelhead guide on the Michigan tributaries for many years, I have had the opportunity to see many big Great Lake brutes get brought to hand. One thing I have seen over the years is that on the Great Lakes tributaries, the bigger steelhead I have taken have all been in the winter months and on the swing. December through February seem to be prime. I believe these big bucks really go on the feed when the water gets cold and salmon eggs aren’t in abundance like they were earlier in the season. A fish of this size really needs to keep on the pounds before it spawns. Just like us when it’s cold, these fish become lazy and don’t want to work to hard. When a bigger meal presents itself, it’s what they prefer over something small like and egg or a nymph. So streamers seem to work for me and my clients. Water level is key not so much in terms of height but in terms of clarity. These alpha fish seem to come out on the prowl when the river has a nice stain to it. I believe that in any situation when the river is low and clear, fish have a tendency to use the wood more, especially on rivers like the Pere Marquette. The Pere Marquette has characteristics of a spring creek. High sun and angler pressure, including boats, can make fish very spooky and push them into the wood. When the water is up and has good color it has tendency to bring these fish back out into their normal lies. What pools do you find these big bucks in? On the Great Lakes tribs in midwinter, we tend to find them in slower and flatter runs. Pools that aren’t super deep but have a slow current speed to them with some type of structure in the area, where they can take refuge in when spooked. They don’t want to sit in fast water because once again they’re lazy and that would just require to much energy. I think that’s why the swung fly gets them in these conditions—because of the slower speed, your fly is getting down in the fish’s face and that big lazy buck doesn’t have to work hard for its meal. This, to me, is a perfect scenario for hooking fish on the swing in the winter. The water is cold so you want your fly to fish slow and get down, you want it to track well with out mending the crap out of the line. These slower runs will fish the fly straight and give it the movement was supposed to have when you tied it. The size of the fly in smaller rivers like the the Pere Marquette I believe is not as big as a factor as the color and movement of the fly. Any way you see it, a streamer is still going to be bigger then a nymph or egg. In the winter, I believe a smaller streamer gets a more solid hook up. I believe color of the fly is big factor in the winter too. I tend to do well with colors that fish well in winter’s low light situations. The sun doesn’t show itself to much up here in the winter months, so I find colors such as purple, chartreuse, pink and blue coax are perfect for steelhead on the swing in the winter months, especially if the water has color to it. Assuming you don’t want to (or can’t) travel north of the Canadian border to do so, here are a few things to consider when looking for big “specs” in your home waters. First, think about where you fish. High-quality trout water isn’t necessarily your best option for big brook trout. Water that lies on the fringe of being trout water often grows the biggest fish. Though I do catch some very respectable brookies from my home river, the Bois Brule in northern Wisconsin, most of my biggest fish have come from warmwater rivers that have some small spring-fed feeders flowing into them. Most of these are not even designated trout water! These streams have an abundant supply of the large foods it takes to grow big fish, and when the water gets too warm, the big brookies retreat to the cold waters of these small tributaries. Concentrate on these types of rivers in the spring and fall (when water temps in the main stem are suitable for trout) and you may be surprised, not only at the size of the brook trout you find there, but also the numbers of them. The added bonus: you’ll be fishing alone because most of these types of places are off most everyone’s radar. How you fish is the second consideration. Big brookies like meat! If you want big brookies, throw big flies. By throwing big flies you accomplish a couple of things. You are presenting something that a big fish finds worthwhile to chase, and you weed out the smaller, aggressive fish that may not be giving the big fish in the area a chance to get to your fly. When you fish is the last factor to think about. Don’t think for an instant that brown trout hold exclusive rights to the night bite! Big brookies, especially in moderate to heavily pressured waters, can and do go nocturnal. In a given season I’ll see more big brook trout come to a mouse at 2 AM than I ever see during daylight hours. The big mayfly hatches, like the hex and brown drakes, are also a good time to look for the big boys. Pick water that you’re confident holds the fish you’re looking for and stay late. If the fish you are looking for are there, they will show themselves for these hatches. There are so many factors to consider when targeting big brook trout, but the one I feel is the most important is covering a lot of water. For me, that means tying on a streamer as the eastern sky is just beginning to brighten, and making a lot of casts before the sun hits the water. It’s important to find that one “player” who is ready to eat and the best way I have found is to work methodically and quickly down the river. Hit the best spots with a handful of casts and move on. If you don’t move that marquee fish with a few casts, it’s unlikely you’ll move it with ten or twenty. So now that you’re moving fast, what’s the best presentation? Down and dirty. By that I mean your streamer should hit the water hard and begin moving the second it touches down. I have watched so many clients let a streamer land and then pause before beginning the retrieve. From my experience I have learned that the slap of the fly hitting the water gets a fish’s attention, and getting it moving instantly triggers the strike.